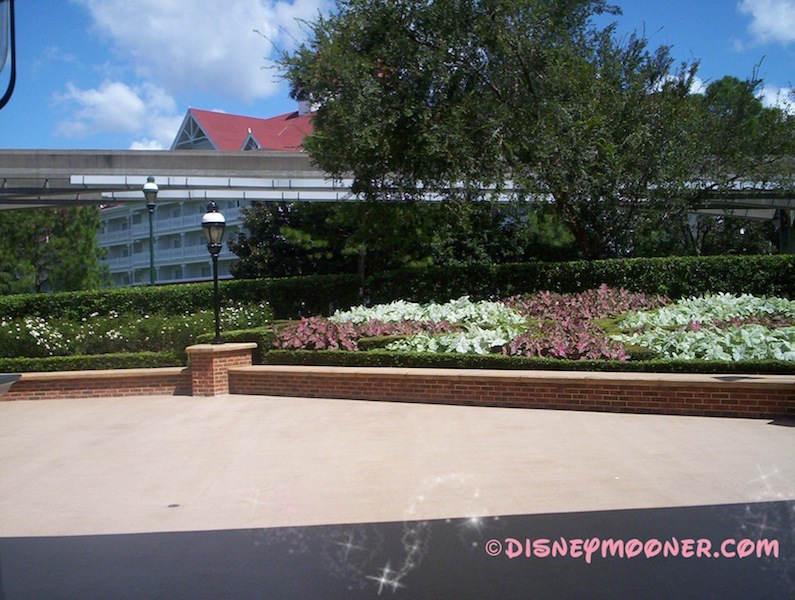 This weeks Featured Venue post was written by Disneymooner Gina. Gina used White Hall Patio for her 2009 wedding reception. To read her recaps join the Disneymooner forums. 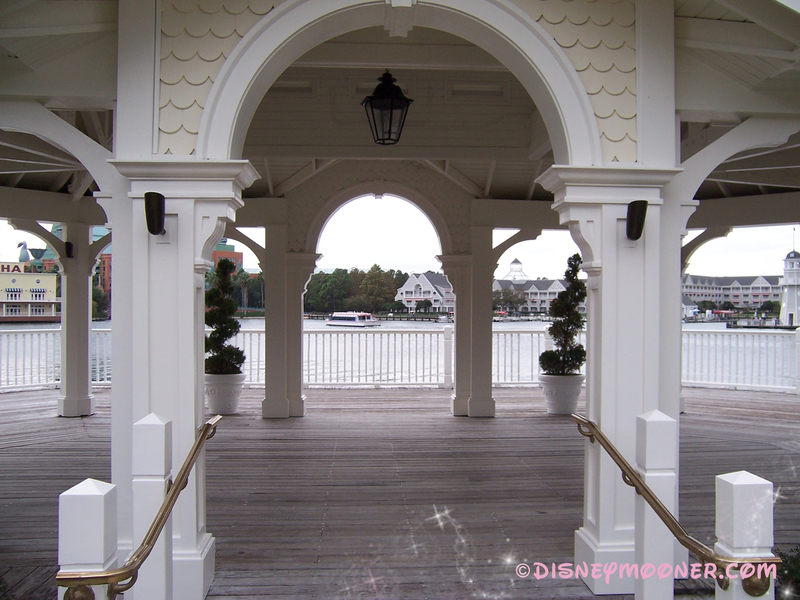 The White Hall Patio located at Disney’s Grand Floridian Resort is a great choice for the bride and groom who want to celebrate outdoors. The patio area is attached to the Whitehall Room which can be used for cocktail hour or as backup in case of rain. You can comfortably host about 50 guests in the area and still have room for dancing. This area is also a popular location for pre-wedding events. The patio is the perfect blank canvas to create the wedding decor of your dreams. On one side you have gorgeous french doors leading to the Whitehall Room/Grand Floridian conference area and a small covered area to set up your cake, buffet if you have one, and DJ. 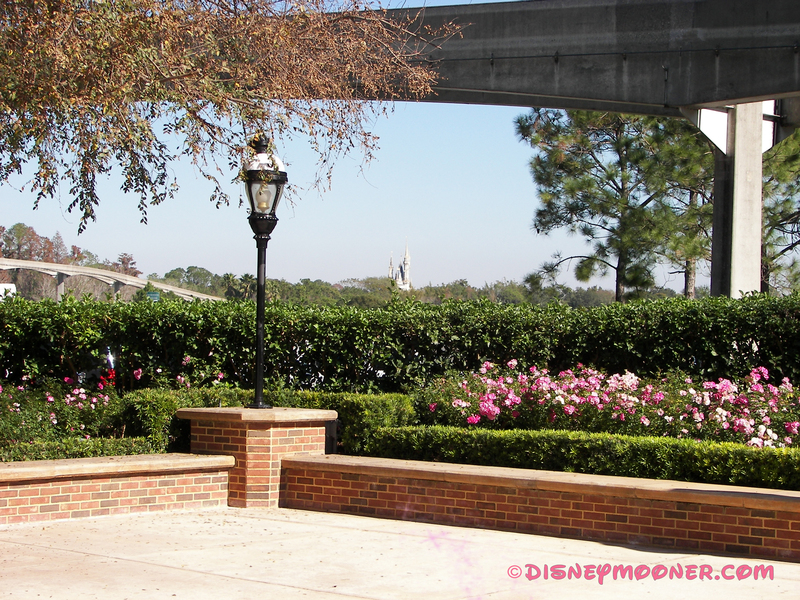 On the other is a short brick wall which can be decorated with flowers, candles or whatever you dream up. In the distance is Cinderella’s Castle, reminding you that you’re in the happiest place on Earth! And up above… ohhhhhh up above is what makes this spot so special, it’s the MONORAIL! 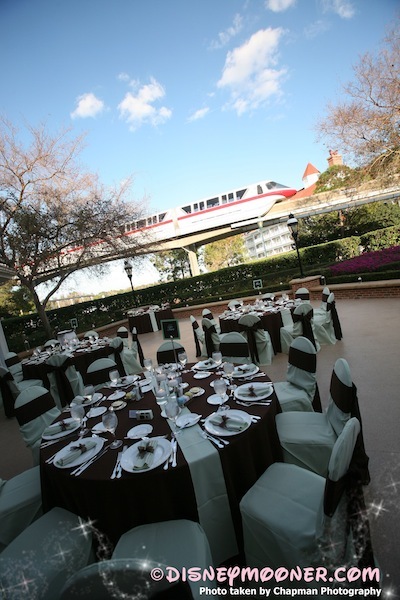 The monorail cruises through periodically adding a touch of Disney magic to your event that guests will talk about for years to come. In case you’re concerned, no, it’s not too loud, I promise! This location lets your decor shine, so get creative with linens and centerpieces, there’s no need to match anything existing because it’s all so neutral. My husband and I chose Whitehall because we love being outdoors. We were married in January and the weather was exceptional. On of the most unforgettable parts of our wedding was during out first dance when the monorail stopped and everyone on board waved to our guests. That moment made me feel like a true Disney princess!! If you’re looking for the elegance of the Grand Floridian but wanting to put your own spin on decor this is the venue for you! Disneymooner Debbie, and her husband John, were married on November 8th, 2009 at the Disneyland Hotel’s Rose Court Garden. They held their reception at Disney’s Grand Californian’s Sequoia Ballroom. Debbie: John and I met at work and dated for 3 years before getting engaged. In fact, we also work with my Dad and he interviewed John before he was hired. If only he knew he was interviewing his future son-in-law! After 3 years of dating, John proposed to me in our backyard by carving “Will you marry me?” into the trunk of our tree. I’ve always been a total Disney fan. John was somewhat indifferent to it but over time he’s “caught the fever” and now he’s a total Disney fan too. We’re now both longtime Disneyland annual passholders and love living about 20 minutes away so we can make quick trips whenever the mood strikes us. Debbie: I was totally stumped when it came time to decide on wedding and reception locations. I had absolutely no idea what I wanted or where to even start looking. It was stressful. Then a friend of mine told me she’d looked up Disney weddings online since she knows I’m such a big fan. She was surprised at how affordable it seemed and told me check it out. Knowing we would probably have about 215 guests I highly doubted it would be anything close to affordable so I didn’t really jump on calling. My mom eventually set up an appointment with DFTW for me, John, and my parents. The sales consultant was showing us the possibilities and I could barely sit still in my seat. Everything she was telling us sounded perfect! Then my Dad asked how much it would all cost …. I was a nervous wreck as she was number crunching. She gave us an estimate and my Dad said “sounds good to me”. I seriously just about passed out. Getting married at Disneyland was one of those “wildest dream” kind of ideas and there we were talking about making it happen. John hadn’t been converted to a total Disney fan yet but he was into it because (1) he knew how much I wanted to do it, (2) everything we saw seemed really nice, and (3) it was something totally different. We both ended up loving everything about it! Debbie: They were all really excited about it! When I told my family we were getting married at Disneyland they said “of course you are”. They know me pretty well. Since the majority of our family and friends all live in Southern California our wedding wasn’t a destination wedding. 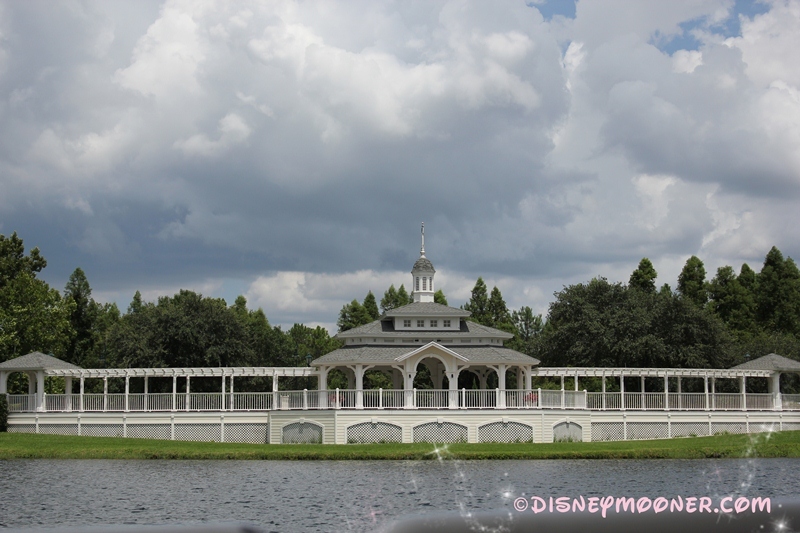 We didn’t get the comments about the expense of traveling like many Disney brides seem to. However, since everyone lives here we also had a ginormous guest list!! Debbie: We were a bit limited in our location choices due to our large number of guests. (It actually made the decision process a little easier.) I had always been adamant that I wasn’t going to get married outside because I didn’t want to worry about the weather. Well wouldn’t you know it, DL has a beautiful garden and gazebo that we knew was perfect as soon as we saw it. Seeing how our wedding was in November, we were a little worried about rain but I knew we’d figure it out. I have always loved the Grand Californian Hotel. It’s just so beautiful and I love the atmosphere. Not knowing how the pricing worked, I assumed it would cost more to have our reception there than at one of the other hotels. When I found out it was the same price no matter which hotel we chose, I was ecstatic! (That sales meeting with DFTW left me on a serious high!!!) At first we thought about using one of the ballrooms at the DL hotel since the Rose Garden was there, but once we walked into the GC I literally got chills. I knew it was the right choice for us. For the both the ceremony and reception we knew our locations as soon as we stepped foot in them. They just made sense. Side note – We chose not to have a Disneyland castle wedding because my Dad just about had a heart attack when we were told the starting price. Debbie: I remember being so relieved that it all looked just as I’d envisioned. All the hours and hours of research and work were totally worth it. The comments from our guests just put me over the moon – it wasn’t just that John and I liked how it turned out, all the people we loved thought it was wonderful too. Talk about a big payoff! I do remember thinking that the ballroom kinda looked like a big box and I wished we’d paid the ridiculous fee to have lighted trees around the walls to soften it up, but that’s the only thing that I remember being a little disappointed about. Overall, seeing it all come together felt great!! Debbie: I can’t really think of anything other than how calm I was and how smoothly things seemed to go. There were a few little hiccups here and there but none of our guests knew any different and I just didn’t care that much. I feared I’d be a nervous wreck about everything but I was able to pass all the coordination off to very capable people and they took care of it. I was totally in the moment and having a blast. Debbie: Two things come to mind – the food and Mickey & Minnie. The food at our reception was absolutely delicious. Our main course was lemon chicken – not that exciting – but dangit if that wasn’t the best darn piece of chicken I’ve ever had. We have several profession chefs in our family and they all raved about it. It didn’t taste like typical “wedding food”, it was a gourmet meal. The big thing that people still talk about was when Mickey and Minnie made an appearance at the reception. It was so fun to watch a roomful of adults turn into screaming 6 year olds. The cameras were snapping pictures like CRAZY! At one point we talked about not having them because we were afraid our guests would think it was kinda hokey …. not an issue! I loved being able to look around the room and see so many people that we care about wrapped up in the Disney magic. 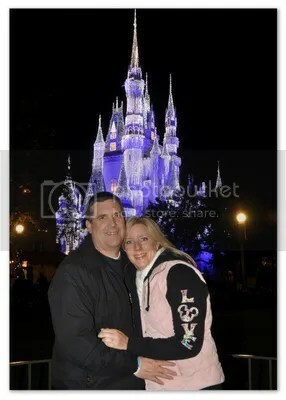 Debbie: Oddly enough, besides Mickey and Minnie, I would say our photographer. She was pricey (and is even pricier now) but our pictures are just as wonderful as we’d hoped. She was able to capture so much of our day in such a beautiful way. She was great to work with, really knew her stuff, and kept us on schedule. She even posted about 20 sneak peaks to her blog early the next morning!! 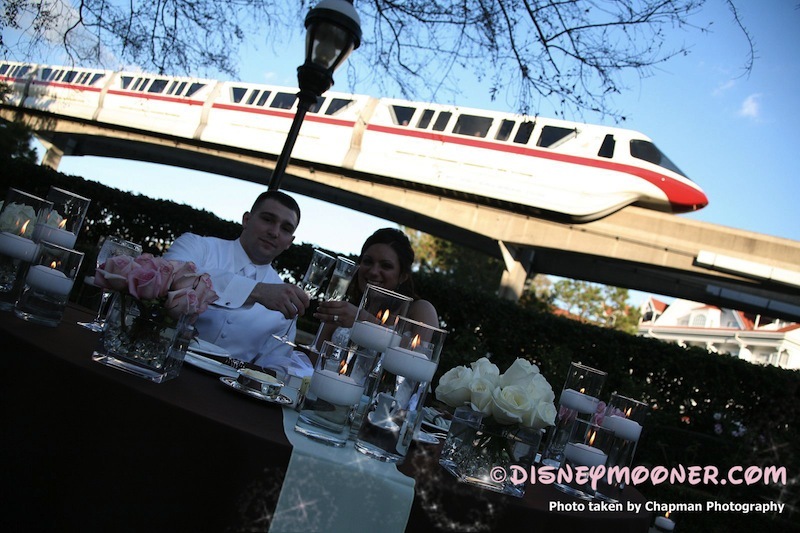 We got to see pics from the wedding before we hopped on the plan for our WDW Disneymoon. Definitely worth every penny. We hired Brian Bosch to handle all our decor. He worked in the Disney floral/decor department but was part of the huge layoff that occurred just as I started planning. He was wonderful!! He handled all the floral, linens, etc. He set up all the decor and even handled our “dancing on the clouds” effect during our first dance. We bought or made a lot of items ourselves and he put them all out for us and truly made my vision come alive. We probably paid a little more for floral than I could have found elsewhere but his expertise and help was totally worth it. Plus, he was friends with the whole DFTW team and knew how Disney weddings worked so it was like have an insider working for us without the Disney markup. I asked to have a mock up of my bouquet made about a week or so before the wedding. I was having a hard time picturing it in my mind and got worried about the colors. I was kind of freaking out about it so I asked how much it would cost. Seeing that bouquet got me so excited for the wedding and put my mind at ease that the floral would be beautiful. Allowed my father-in-law to pay for chair covers at the last minute. I cut them in a cost savings move but a few days before the wedding he told me he really wanted to make a contribution so I called and had them added. They added so much to the decor. It really helped it all come together. I’m adding a 4th because I just thought of a big one – I’m glad we hired a videographer!!! This was one of those things that some of my family thought was unnecessary but it’s one of the best decisions we made. The day is so filled with emotion and goes by so quickly. Without our videos I wouldn’t remember half of it! I honestly only had minimal recollection of the ceremony before we got the video back. Even if your videographer is just your cousin sitting in the second row, get a video!!!! Debbie: I wish I had scraped together enough money to have those lighted trees around the ballroom walls. I wish I’d thought to ask if we could do an in-park photo shoot. 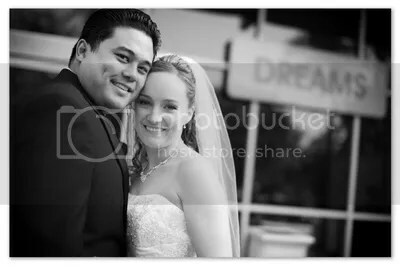 (I saw another Disneyland bride had negotiated one a few months after our wedding. I was kicking myself for not even thinking to ask!) I wish we’d stayed at the Grand Californian one more night before rushing off on our Disneymoon – we were exhausted the next morning. Really, that stuff is kind of minor though … our wedding was so wonderful! Disney and our amazing vendors helped us pull off the wedding we were dreaming of. We have such great memories of it all. Debbie: You would think there would be, but I can’t think of one at the moment. I just wanted pictures of it all! Pictures with our families were important so we made a must-have list. Debbie: Get started early with planning and doing any DIY projects. It gets crazy stressful in the end and you don’t want to turn into Bridezilla. Be patient with your planner (especially if you’re a far way off from your date) but at the same time don’t hesitate to speak up if you don’t feel you’re getting an appropriate amount of attention from them. You are paying them after all. Have faith that it will all come together in the end and be wonderful. It may not seem like it sometimes, but it really will. Oh, and be sure to visit the Disneymooners regularly for inspiration, advice, and support! I don’t know what I would have done without this site. 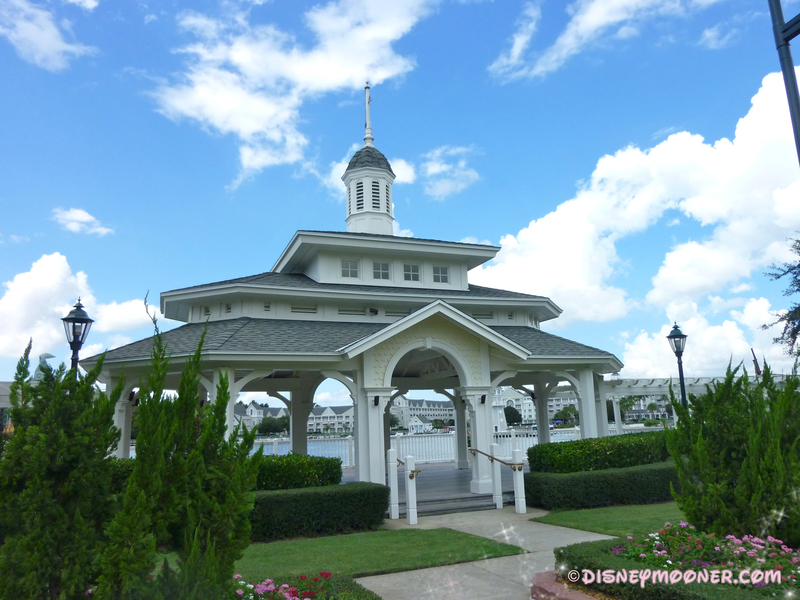 Sea Breeze Point is an open-air pavilion, that sits on the shores of Crescent Lake, and gives stunning views of Disney’s Boardwalk, Yacht Club and Beach Club Resorts. It is the only outdoor location that is completely covered and gives your guests excellent views of your wedding ceremony from all angles. The venue can hold up to 80 guests which makes it an excellent choice for both Escape or Wishes Weddings. 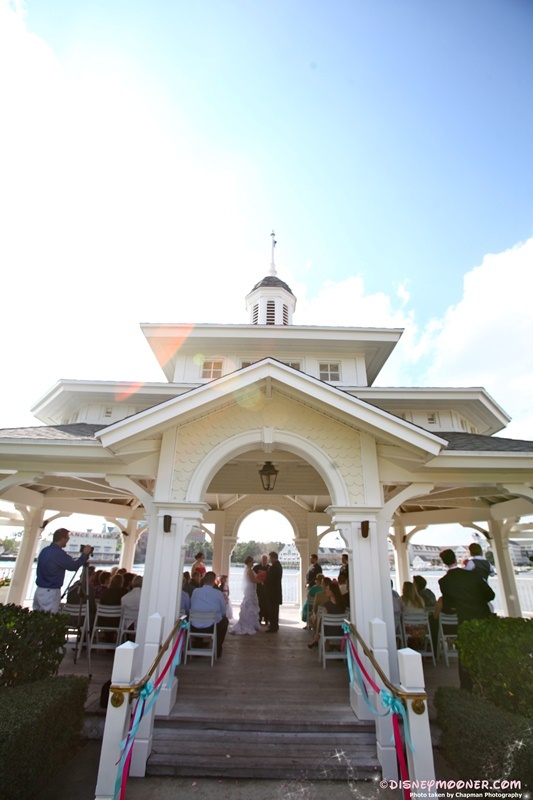 The EPCOT resort area recaptures the 1940’s Boardwalk charm and is perfect for those couples who want to incorporate a beach or vintage theme into their wedding. Imagine walking down a beautiful, breezy, wooden boardwalk instead of a traditional aisle on your wedding day. Perhaps you want to make a grand entrance in a horse- drawn carriage or a vintage car. Many Brides choose Sea Breeze Point for its great location to many wonderful reception venues such as Atlantic Dance Hall, and the stunning Ballrooms at the Boardwalk Resort. Along with the romantic vintage style of Sea Breeze Point, we loved how intimate the space feels. All of our guests, who are most important people in our lives, will be seated in the gazebo during our ceremony and that will be very special. During our ceremony, a boat passing by beeped the horn, which you can hear in our video. Some couples might have an issue with that kind of thing. But I thought it was so cool! When we got to Sea Breeze Point, my heart skipped a beat. It was beautiful. I think what really drew me in was the view from there. It was on the water and you saw the lighthouse and Atlantic Dance Hall in the background. Since we were having our reception at Atlantic Dance Hall, I loved the idea of our guests being able to see where we’d be celebrating later on. Imagine transporting your guests under the sea and hosting an enchanted wedding reception in one of Disney’s theme parks. 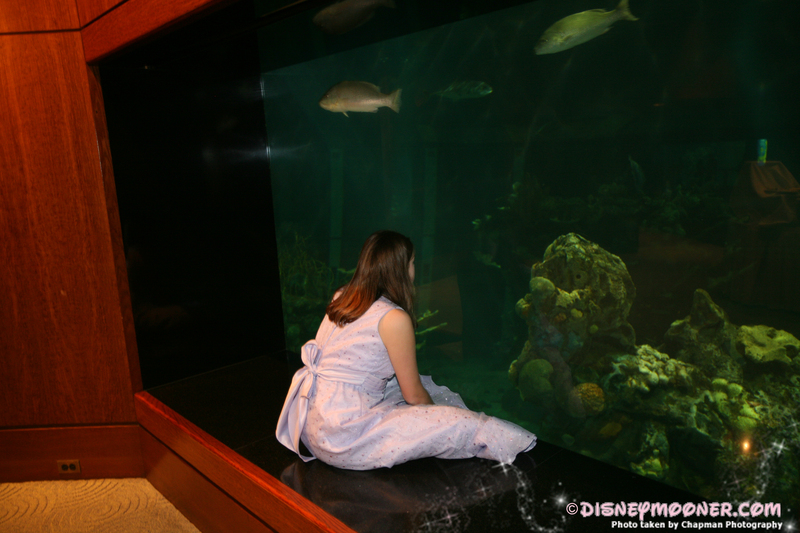 The Living Seas Salon is a private area found in EPCOT’s The Seas with Nemo & Friends Pavilion and showcases a wall of glass windows overlooking a 5.7 million gallon aquarium. Your guests will be amazed at their incredible view of a wide array of sea life, as they dance and eat dinner. This venue can be used for weddings of 20-104 guests and has pre-existing tables of six. 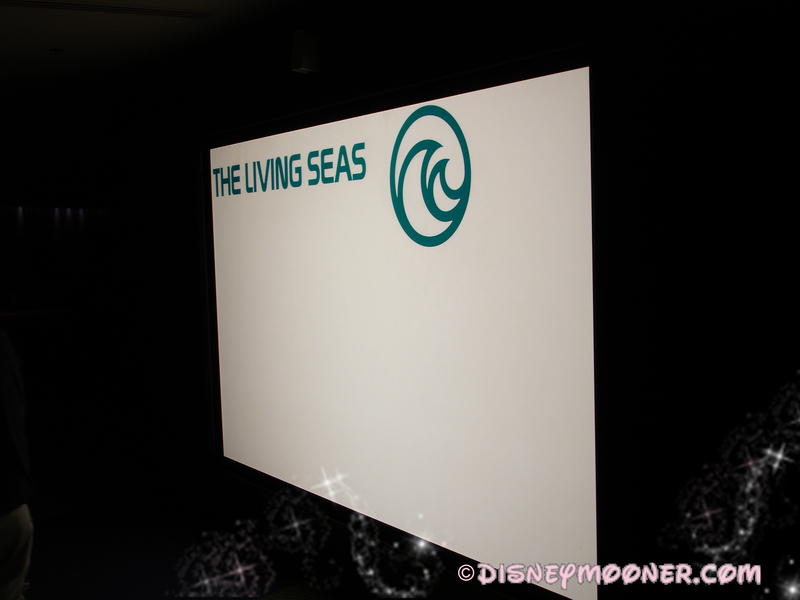 The Living Seas Salon already has pre-existing vibrant blue and green table linens. However, brides who want to accent their own wedding colors can change these linens for an additional charge. Since the Living Seas Salon is a private venue, it gives brides and grooms the ability to have an in park reception during park hours. The venue can be used for lunch and dinner receptions and is spacious enough to have a multi-level seating area. Your cocktail hour can be hosted in a connecting room, giving the venue an intimate feel. The biggest highlight of this location is the stunning view and its the only venue were couples can add Scuba Mickey to surprise their lucky guests. The Living Seas Salon other big selling point for Brides and Grooms is the pre-existing décor. Many brides feel that the location needs very little in terms of additional decorations. 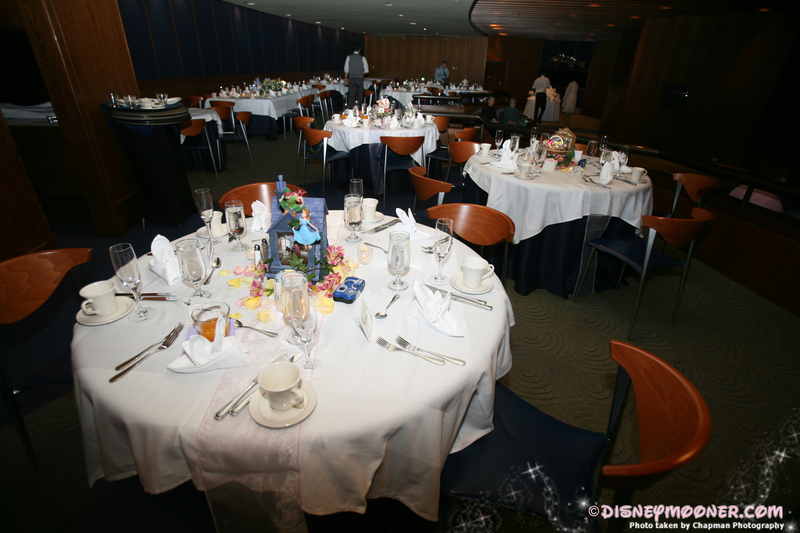 If you are considering the Living Seas Salon or have had your wedding at this venue, one thing is certain: This venue is one that your guests will soon not forget. 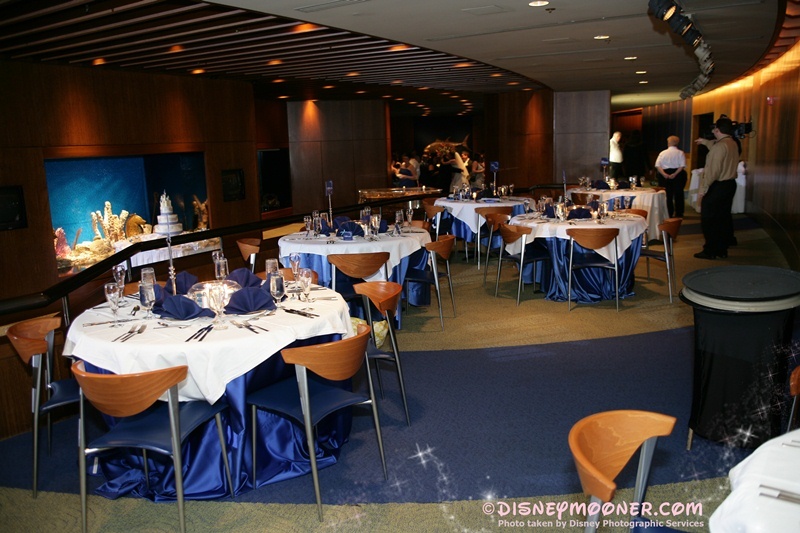 For more information on the Living Seas Salon, including pricing minimums, site specific restrictions and wedding recaps please visit the Disneymooner Forums.